Nerd. 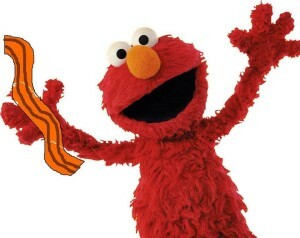 Purveyor of Shenanigans and Bacon. I have a new job. It’s not that I didn’t love the thrill of working from home (pants optional), it’s just that I was recruited by a fairly amazing local company as a marketing copywriter, and I’m a sucker for a dynamic, fun, hilarious group of people (and the money), so I put my pants on and now work full-time. Go go gadget verbiage! The takeaway: Keep your LinkedIn page updated because it’s magic. I’ve been so off plan. Like abysmally off plan. Like so high carb, Little Debbie offered to put me in their calendar. The takeaway. My navel’s even so fat, they were worried it would absorb the staple and then ask for seconds. That said, I’m back and I’ll write at least once a week so long as you keep reading. I’ll let you know what I’m eating and doing so you can follow along. I love keto. In my day, we called it Atkins, because he was the only game in town. Nowawdays, it’s called keto. I think that’s cool. And people don’t accidentally hear you saying you follow the “Napkins” diet. I don’t eat napkins. Though right now I might look like I might, especially if a donut was stuck to it. I’m back on day 2 of low-carb, and I’m feeling pretty legit, so we’ll talk more about that, too. Still, it’s cool my work is still popular, right? RIGHT?! What’s with the cloud bread name? They’re not clouds; they’re crumbly bits of bread. But sugar? Really? In the oopsie rolls? Gads. I’ll see how I’m doing later today since obviously these contain dairy. After spending most of the night feeling incredibly lousy, I’m not keen to relive that again anytime soon. I did the hell out of this: I took 2,039 steps for .86 miles. I’m tracking every day because it helps (and others have asked me to). Accountability; it’s what’s for dinner. Keep track of the progress here, in the tab titled “Weight Loss” and feel free to jump in and join the convo. I weigh in on Mondays. It keeps me especially honest on weekends (and if anyone needs babysitting on the weekends, she’d be me. Hey; those extra dark chocolate chips, whipping cream and episodes of Arrow aren’t going to eat and watch themselves). 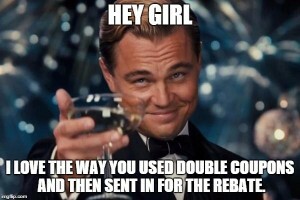 We all do it. That little fist pump of victory when we buy a Raise.com card and stack it on a store coupon. Or the time you got your free Birthday lunch and scored a freebie for a friend by becoming an e-member. 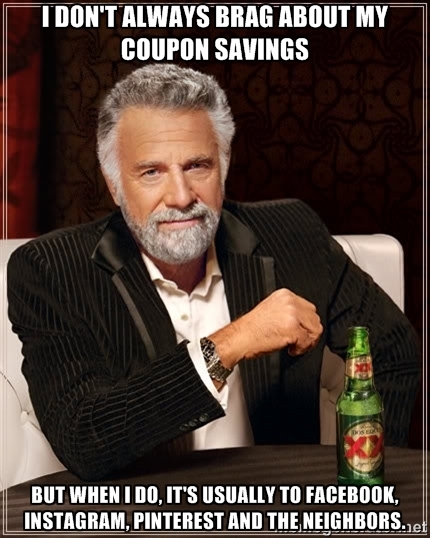 We won’t EVEN talk about the time you got an in-store discount, combined your rewards and then bought an item on closeout (OK, maybe a little). How can it get any cooler than that? I’m leaving this one to the gents (okay, and hyperboleandahalf). That’s right. 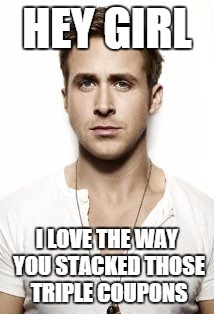 Ryan loves it when you bring the magic. Those coupons aren’t going to clip and spend themselves, you know. What, Leonardo? 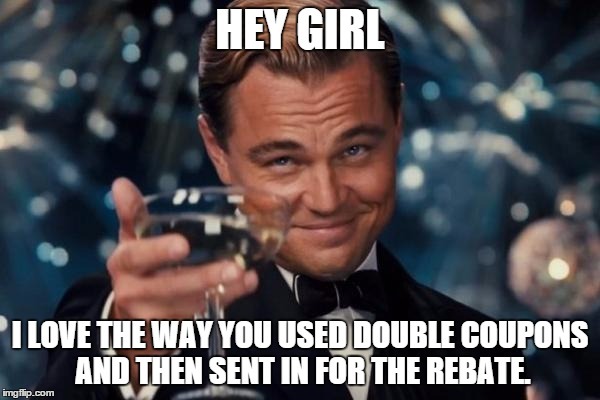 You’re toasting to layered cost-savings options? I’ll bet he doesn’t even know you scored that glass on closeout. Well played, babe. 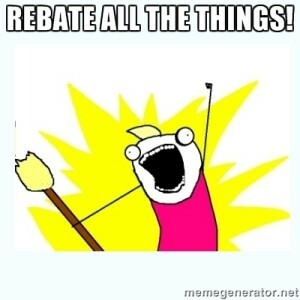 Like bacon, rebates are the special magic unicorn sprinkles on top of the savings loaded baked potato. Great; now I want potatoes. Thanks low-carb, potatoless existence. 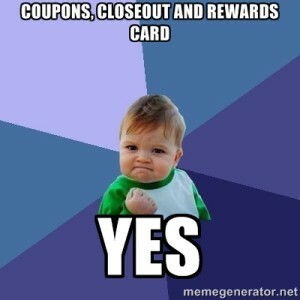 But then there’s victory… Like the touchdown dance of savings, it is mandated you must flaunt your awesomeness. And why not, my friend? It’s what the universe intended. Put on your shopping game face on and get out there, tigress. 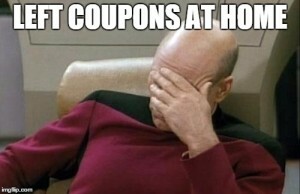 Some might think you’re merely clipping coupons, but you’re grabbing life by the savings. Does a black bear eat carbs in the woods? Okay so it’s not a real black bear. In fact, it’s more along the lines of a Black Bear Diner. That’s great, I thought, as I nodded to my 23-year-old son, excited with glee at wrapping his mitts around the commendably-sized portions of beef and bread. 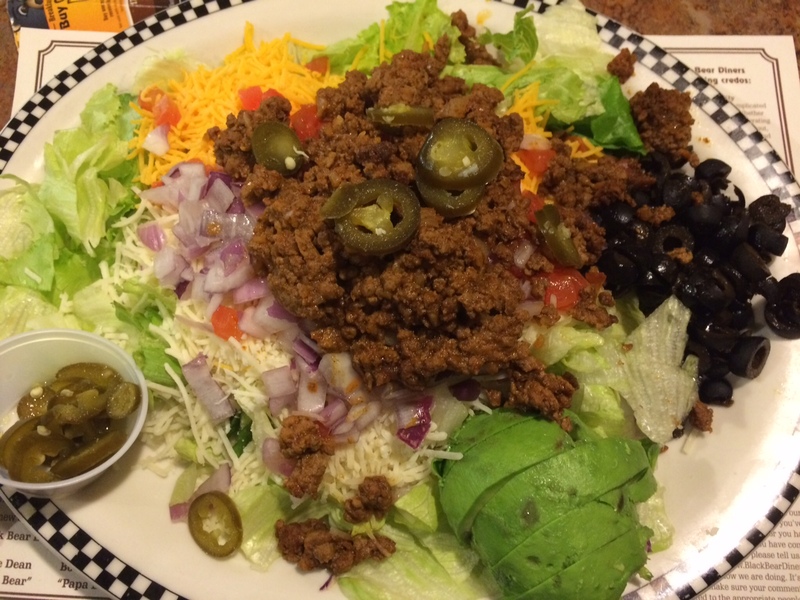 I’ll just order my usual taco salad minus the beans (pictured left) and the shell and call it a low-carb day. There’s no reason to go crazynuts after all. Alas, that was a nice plan, wasn’t it? Today, however, the side of my face is imprinted with QWERTY keys from resting on my laptop and my stomach wants to show me what Old Faithful can do. Even the bacon I cooked this morning isn’t sitting well in that churning, gurgling cesspool of indigestion. Sure, I went into the restaurant bedecked with black bear caricatures and kelly green wall coverings anticipating a little something extra. I mean, I deserved a few extra carbs after over two solid weeks of Atkins ’72 and 17 pounds lost. What’s the harm in the taco salad with the shell and with the refried beans so long as I placed them to the side, grabbing a small bite here or there as needed? Only I didn’t order that. Oh no. I could have, but I didn’t. Instead, I made eyes at the menu’s Patty Melt, and she gave me eyes back. It was a little like the Katy Perry song, only I didn’t plan to lip lock a girl; I planned to embrace Patty. Oh, Patty. And because it was a smaller meal, it only (?!) clocked in at 910 calories and 100 carbs. As many carbs as I typically eat in an entire week–combined. After my moments with Patty, and feeling very little pain (probably the carb rush and endorphins), the dessert menu magically appeared at the table. As I stared down at the dancing bears beckoning me to partake in something delectable, I told myself why not? I’ll share the triple brownie fudge sundae, so it wasn’t like I was eating the whole thing myself. Besides, did I deserve this? 450 more calories and 100 more carbohydrates full of dessert, I walked out of the restaurant feeling full. But alas. That was yesterday. Today. Today! Today, with a runny nose and water weight gain of 2 pounds, I’m feeling like I’ve been smacked with the barfy stick. I haven’t felt this bad since I had the flu a few months ago. I feel, in a word, miserable. Oh, Patty! How could you? As remnants of Black Bear Diner apple crumble leftovers waft through the air every time I open the refrigerator, I announced loudly I’d pay anyone a dollar to eat it. Heck they didn’t even have to eat it. They could throw it in the shrubs. Who knows? Maybe a black bear will find it. I think I might just deserve to see that.